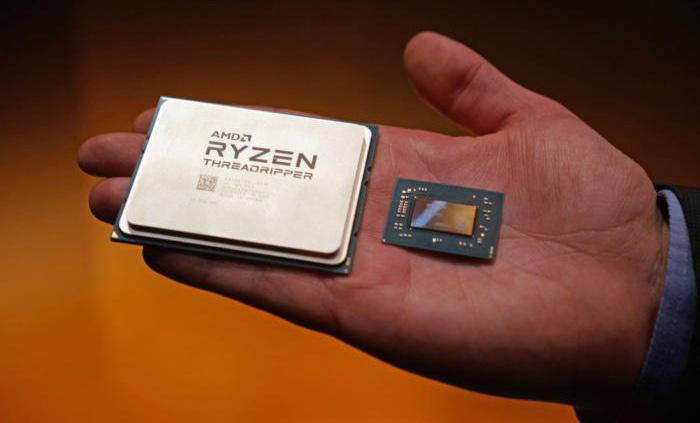 A couple of days ago we saw an official AMD presentation about its Threadripper HEDT processors which boast up to 16 core and 32 threads of processing. We learnt about the new X399 motherboards from the likes of ASRock, Asus, MSI and Gigabyte, and got an outline of the attractive features that will be on offer for the platform. At the Computex press event AMD focussed upon the flagship Threadripper with 16C/32T - but what about other Threadripper processors? The above nine SKUs are based upon a dual 'Summit Ridge' multi-chip module design. All of them have SMT enabled, full 64-lane PCIe gen 3.0 root-complexes, and full quad-channel DDR4 memory interfaces. You will note that five of the nine Threadripper processors carry the X suffix denoting XFR (extended frequency range) support. In comparison with the recently announced quintet of Intel Core-X Series processors, AMD's lineup looks strong in the above stats and we have yet to point out the apparent TDP advantages on AMD's side. Unfortunately the pricing data has yet to come through for AMD's range too. AMD Threadripper processors and partner designed X399 chipset motherboards will hit retail later this summer. I have an i7 but certainly interested in these processors. Depending on the price can see one in my next build. Pretty sure due to how each Zen CCX can be configured, that only even cores are possible. Since Threadripper is basically two Ryzen 7 (i.e. four CCX altogether), the only possible core counts are 16 (4x4) and 12 (4x3) and possibly 8 (4x2). Others options are not ‘possible’ (or at least AMD decided that asymmetrical CCXs are not practical). So this news is highly suspect at least as 10 and 14 core-count CPUs are concerned. I believe the R3 chips and APUs will have a single CCX, so odd numbers can work. I wonder if we could see a Threadripper APU with 3 CCX and a GPU? I was sincerely hoping that was just a code name, because, performance aside, that naming sounds just plain stupid. As in “moar g4mz0r” stupid. Wasn't there talk of Ryzen R9 at some point?